Our local art trail is now available here. Follow the trail to explore local artists based in Tooting, Furzedown and Balham. Collect a letter from each house to guess the name of the hidden local artists and enter a prize draw win your own work of art or craft – all handmade in Tooting, Balham and Furzedown. This year we also have details of the many creative workshops, talks and demos that will be available in artists’ houses over the two weekends. Go explore and create! Huge thanks to Louise for co-ordianitng the trail and Sue Rentoul who designed our leaflet! 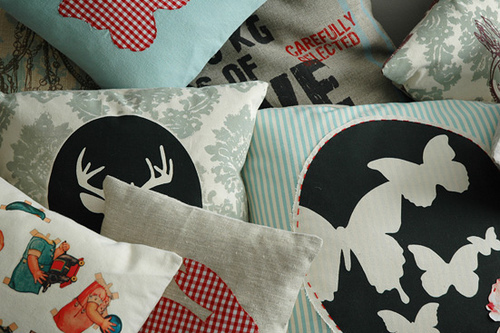 Meet Margarita Lorenzo, the textile/graphic designer behind Chocolate Creative. Tell us about your work. What do you make? 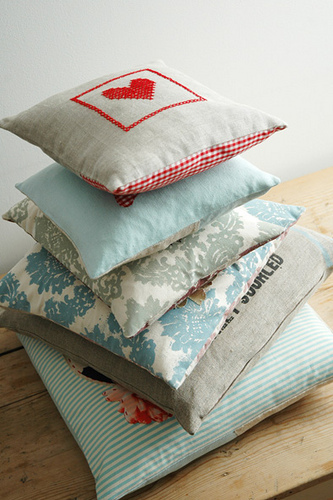 I make textiles mainly cushions, an other accessories such as tea towels, bags, lavender hearts, purses and Christmas decorations. What is your background in? Did you go to school to learn your printing processes? I started out as a graphic designer after training in fine art and graphic design in Spain and England. After many years working mainly in graphics, my passion for textiles drove me to learn and discover new ways to apply my graphic knowledge to textiles; so I started my training in Printmaking and textiles, where I discovered screen printing and fall in love with the process!! I learned different printing and dying techniques, as well as how to work with different materials and produce my own patterns. This is a learning process that never ends!!. Where do you get your inspiration for your prints? I look for inspiration in traditional craft, embroidery, stitching, old linens, vintage textiles, the colours and look of old houses in Cuba and Brazil, etc…I like mixing the old with the new and that is what I try in each design, to bring a bit tradition into a contemporary piece. My love for interior design, and anything to do with furniture, antiques and old loved things, led me to develop the ‘Decayed Glamour’ collection. Why are you taking part in Wandsworth Artists Open House? It is always nice to spend some time with other creative people, and meet new faces and promote the business, I am very much looking forward to show the new eco textile line, and the new vintage designs for children. What’s your favorite part of creating a piece? The hand made collections use a long crafted process, from the drawing of the pattern to the silk screen printing to the sewing. I enjoy every step of the process but I would say that the beginning of each collection is the most exciting one: the brainstorm for ideas, sketching and looking for inspiration in museum, (my favorite V&A in London), junk/ antiques markets and shops. I love experimenting with different inks colors, and materials. Whats a fun, random fact or story involving your work? I have a small studio at home where I print and do the rest of the work, this small space doesn’t allow me to work at big scale or do other things like printing many colors at one, but rather that seeing this fact as a negative one I use the hands on process to create more personal and unique pieces, sometimes I get happy accidents that leads me to a new design or challenge my work in a different direction. So many people inspires me, specially people who had a difficult life and never gave up on their work, such as Vincent van Gogh, as well as the architect Les Corbusier and his visions for a modern life. Designers like Lisa Stickley who stared making textiles and now have grown her collections and has opened a beautiful shop in London, and so many talented designers and makers – that I get to discover every week through the amazing global blog community and magazines – that make a living out of what they love, run small business and make our lives more beautiful with their creations!!. What’s the next step for your work? Do you have any upcoming projects you could tell us about? 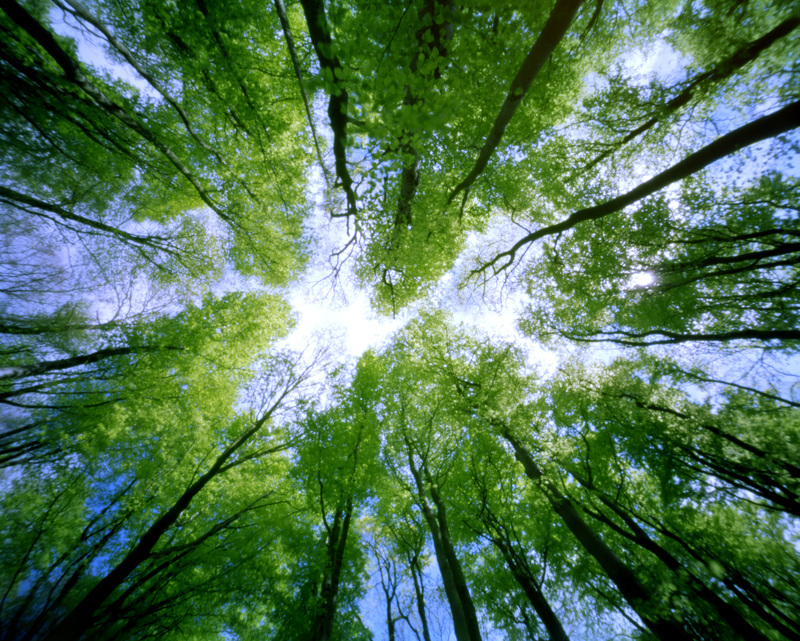 I already print on ecologically sound fabrics, such as hemp and organic cotton. 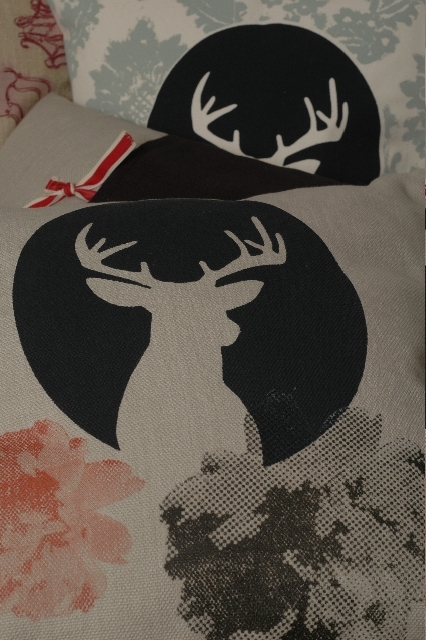 So I would like to carry on my research into sustainable fabrics and way of printing, I would like to make my products as ecologically as possible. I have started to think of the new collection which I would like to launch next year, together with looking into printing on ceramics. That, if you are lucky enough to find your passion in life, go for it!! Don’t be scared of trying, it is very rewarding to work on something you love and feel passionate about it. Sometimes it is very hard, and it is difficult to stay motivated but somehow I get my strength from my heart to keep me going. Believe in what you do, work hard, stay positive and when feeling doubts, stop, have a break, relax and enjoy life, look for inspiration around you, and come back with more energy and a fresher approach!!! Thank you. Chocolate Creative will be at veuue 70 during week 2 of the open house. What type of artwork you do? 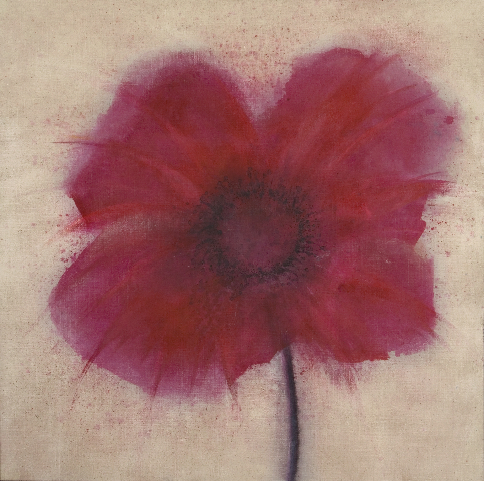 I mainly produce paintings with flowers, some are quite representational whilst others stray more abstraction. I am obsessed with colour; I am always trying to build more vibrancy and depth into my work with layer upon layer of translucent, inky washes of colour. What inspires you / influences your work? Inspiration can come from so many places – I’m always looking for texture, pattern and form whether in the natural world or elsewhere. The most amazing colours and textures can be seen on tree bark or more unlikely objects might inspire such as the patina on a rusty sheet of metal. Where did you train / develop your work? I’ve drawn and painted all of my life. I did a degree in Fine Art at Hope University, Liverpool. Afterwards I worked as a scenic artist in the theatre for many years. I enjoyed this greatly and it had a great influence on the work I produce. 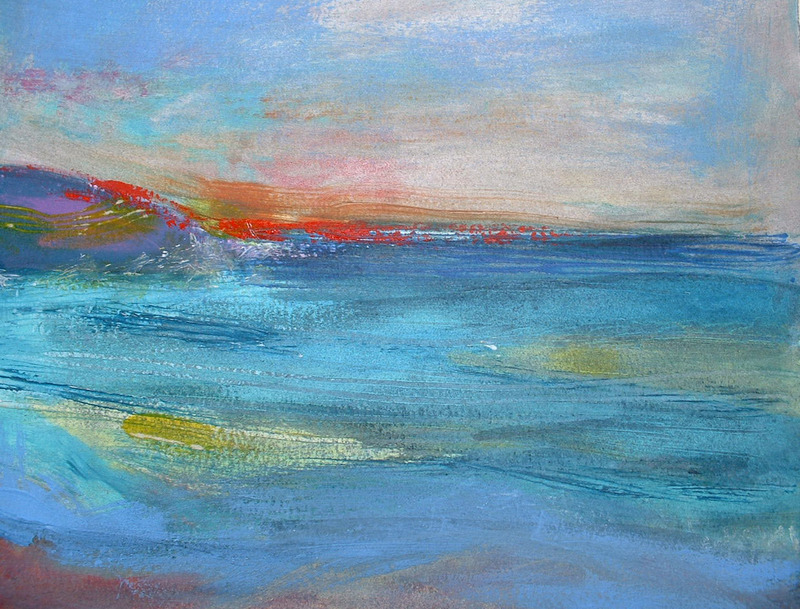 I now paint on a range of different sized canvas, but I do like to work on a large scale. Why are you taking part in Wandsworth Artists Open House? To publicise and show my work in the vibrant community where I live. What do you like about being an artist living or working in Tooting and Furzedown? I’ve always enjoyed living in Furzedown and now I’ve met so many other artists living and working locally through Wandsworth Open House it’s even better. Who is favourite artist / art work and why? One of my favourite artists at the moment is Elaine Pamphilon- an artist who paints St Ives and it’s environs so beautifully. And finally, do you have any exhibitions planned? Thank you. 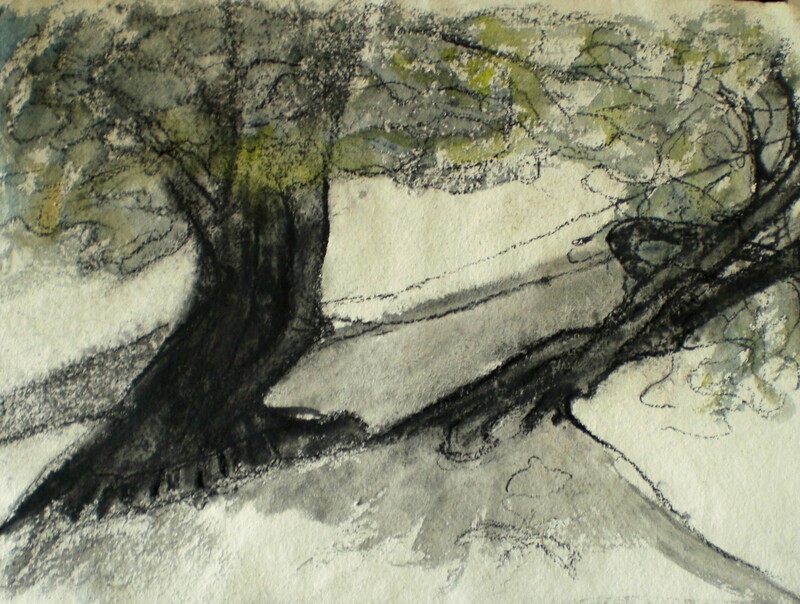 Emma Forrester’s work will be on display at venue 67 in the brochure. What type of art work you do? 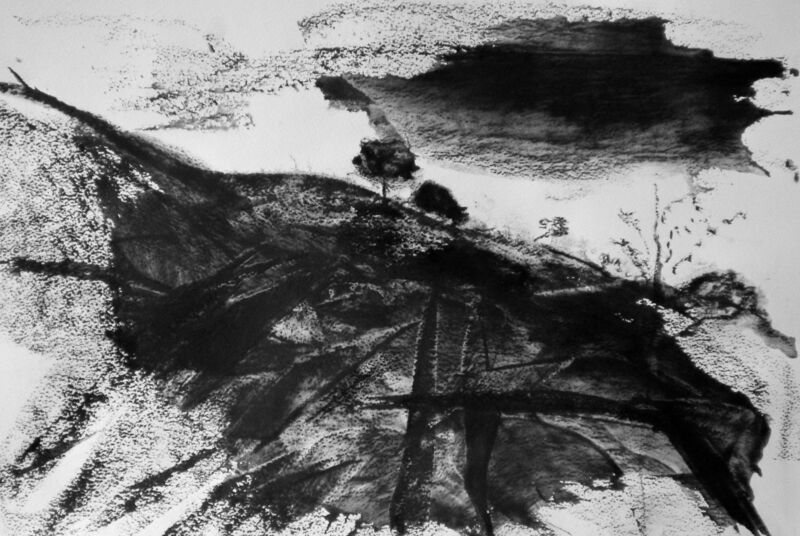 Landscapes and life in charcoal and/or watercolour mainly, but sometimes I find an image begging for, for example, a drypoint line, or collograph (printing from a collage). I do paint in oils but find I am less free. What inspires you / influences your work? 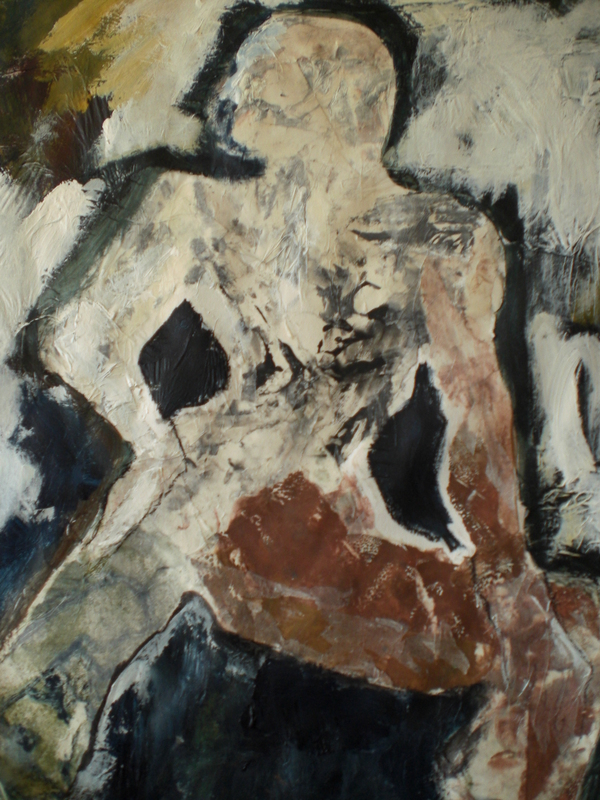 Looking for the essence of something I see that excites me – the colour of a model’s skin, where the weight lies in a pose, the angle of a tree against a hillside, shapes within a landscape – trying to express the key. How did you come to be doing this type of work? It all started with Life Drawing which I could pop along to a group or class and do even when bringing up my family of four. And I still need to do it from time to time to “keep my eye in”. From the body to the landscape seemed a natural transition. Where did you train / develop your work? Always Adult Education over many years: Folkestone Arts Centre, St Ives School of Painting, South Thames (in the days when there was Life Drawing in Tooting!) Morley College, etc. I have been “opening” my house with friends since 1998. Of course I like to sell some work, but it has also proved a means of making new friends who may be other artists or neighbours and nowadays a community activity. What can visitors to your open house look forward to? A warm reception and a works in a variety of media. This year visitors will, in addition to my paintings and drawings, be able to see some fine etchings by Christopher Browne, brightly coloured felt bags and gifts, Lesley Martin’s ceramic doves, fat cats and pooches – simplified creatures with individual personalities and Ann Funston’s watercolours and glass panels, dishes and jewellery. Whose work are you looking forward to seeing in the Wandsworth Artists Open House? I’ll be lucky to see anything! It is difficult to leave the house because when people have been invited they expect to find you there! But I am most likely to be able to pop along to Cynthia Wild, a very exciting artist and Sally Dunnett the glass artist. I have yet to see the work of Adam Tudor who is actually probably the nearest – that is a must this year because he called when I was out last year. What do you like about being an artist living or working in Tooting? I can live and work in my house where most of the time it is surprisingly very peaceful and then touch a vibrant world by just walking around the corner. Who is favourite artist / art work and why? Ben Nicholson – the master of simplification of landscape. What new projects do you have planned next? Having had a busy summer doing lots of painting in the English countryside, the next months will be a time to contemplate the work I have done, where it is going and where to take it. And finally, do you have any exhibitions planned? 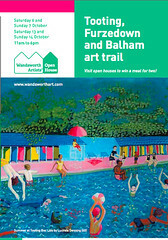 As a member of WAC (the Wandsworth Artists’ Co-operative) I hope to be showing in Battersea in November and at the Cotton Atrium in May 2010 if the plans come together. Thank you. Valerie’s work will be on display at venue 56 in the brochure. What type of art work you do? How did you come to be doing this type of work? Winchester School of Art. 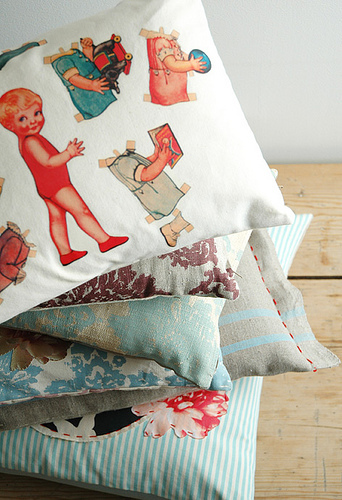 I studied textile design and worked as a fashion fabric designer and colour consultant. After a career break I completed a printmaking course at London College of Printing and now produce monoscreen prints and landscapes as well as felted lambswool cushions. Much less formal than a gallery and I can hang pieces the way I like them. What can visitors to your open house look forward to? 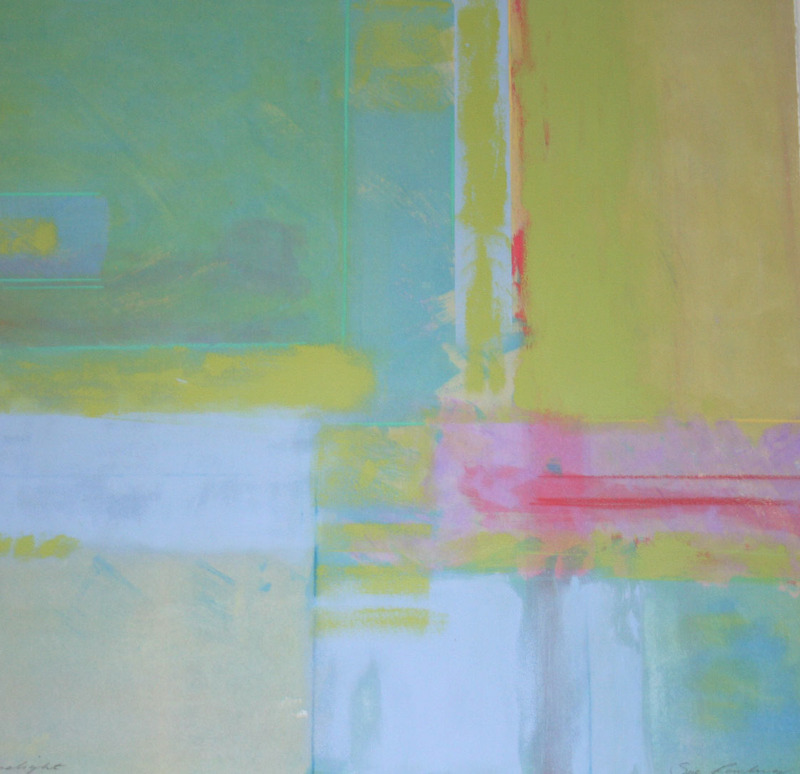 Colourful landscapes, abstracts, collaged still life prints and lambswool cushions. What new projects do you have planned next? I have just sold a large collection to the Royal Bank of Scotland and am now working on some large scale abstracts for another Corporate client. 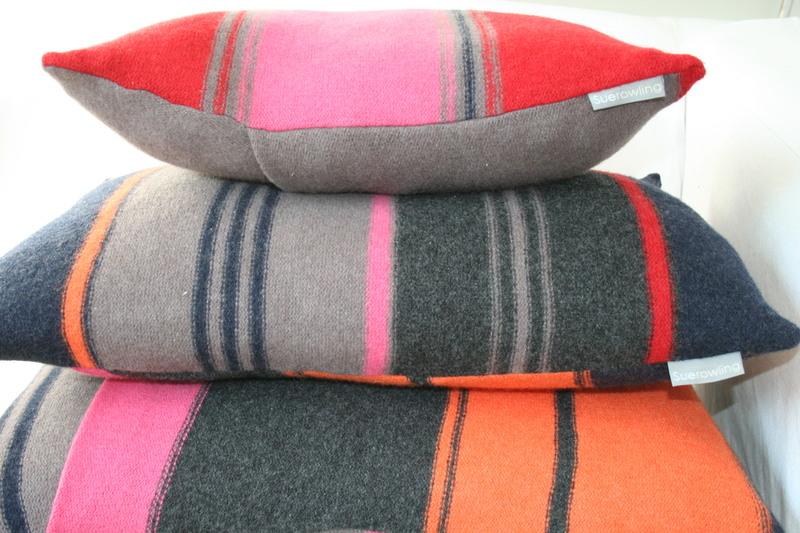 I am also planning to introduce more colours into the cushion range. I am showing at Art for Youth at the Mall Galleries and the Affordable Art Fair with Greenwich Printmakers in October 2009. Thank you. 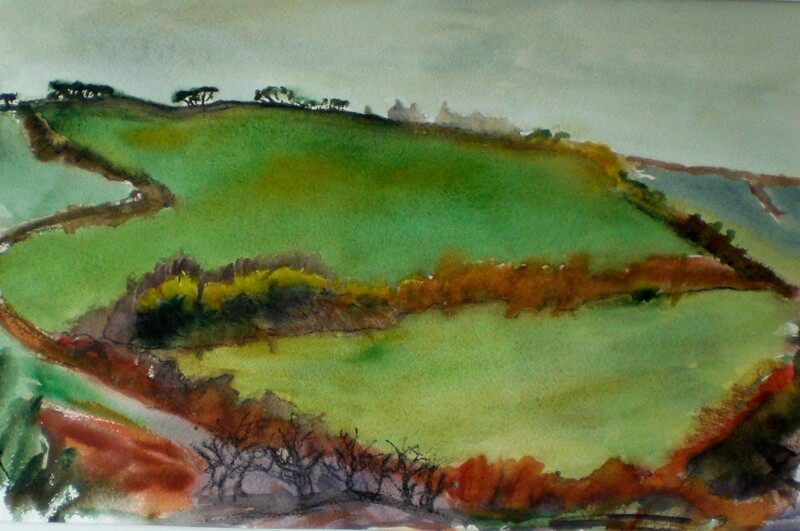 Sue’s work will be on display at venue 72 in the brochure. What type of art work you do? 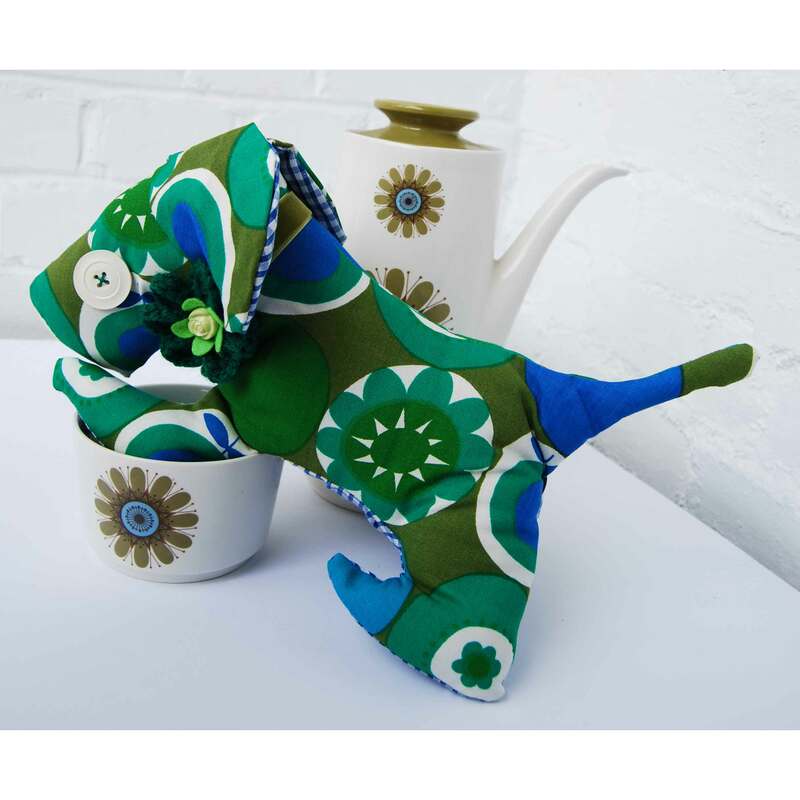 I work with vintage fabrics from the 1950s, 60s and 70s, reworking them into accessories and homewares, including purses, brooches, fascinators, dogs, birds, cats and bags. I will also have a Halloween range using some of my contemporary US designer’s fabrics, including some scary bunting and spooky jewellery! What inspires you / influences your work? I love print and pattern, particularly simple printing techniques. My favourites at the moment are souvenir fabrics with simple screen printed seaside scenes, often just two or three colours, on vintage linens. 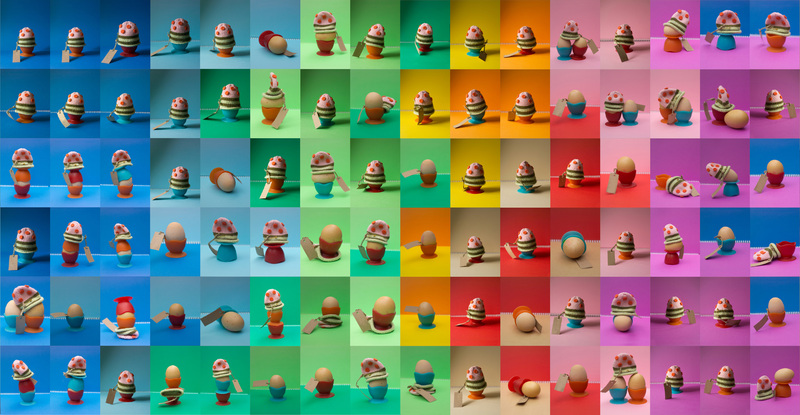 They evoke bright, sunny holidays with the simplest of images. How did you come to be doing this type of work? Since my teens I have been unable to walk past a pair of curtains without wanting to snip and stitch them into something to wear or use. I enjoy taking something old and unused and upcycling it into something with a new life. Where did you train / develop your work? I am self taught, taking my inspiration from vintage pattern and craft books and the DIY ethos I grew up from the post-punk years when I first had market stall as a teenager and was also running a record label. I grew up with people my age all making things themselves, from music to art to clothes and love the current resurgence in crafts seen in the neo-crafting movement. Why are you taking part in Wandsworth Artists Open House? I have been taking part in open houses in Wandsworth, Dulwich and Brighton and love the opportunity to meet local people who share my delight in vintage fabrics. Through open houses I have met many inspiring local artists, and I am very excited about this year as some of these local artists are joining me in this years’ open house. What can visitors to your open house look forward to? 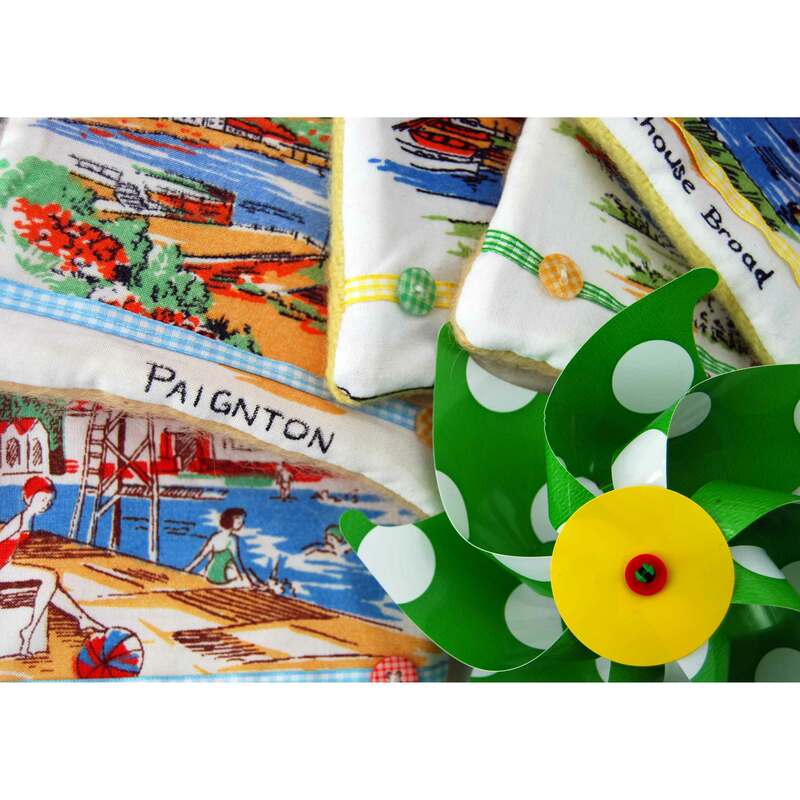 We will have a feast for the eyes, with lots of vintage fabric creations from me, but also jewellery from Louise Williams, Amelia Critchlow’s textile narratives, fused glass from Mandy Treptow and contemporary cushions and accessories from Chocolate Creative. Homemade cakes and cups of tea will be available as well as a chance to join in our bunting and brooch making workshops on each afternoon of the open house. We have lucky bags for the first 20 visitors to our house! Whose work are you looking forward to seeing in the Wandsworth Artists Open House? Looking at the other Meet the Artist interviews I am overwhelmed by the creativity and talent that exists among my neighbours and can’t wait to see some of this work for real. What do you like about being an artist living or working in Tooting? I have lovely creative neighbours I have met as a result of the Open House and enjoy the diversity on Tooting’s streets. I feel very lucky to be living in London, with people from all over the world making this one of the most wonderful cities in the world. Beautiful green spaces are a short walk away, including the fabulous lido, the best swim in town. And of course some fantastic fabric shops! Who is favourite artist / art work and why? My current faves include contemporary textile designers who’s work is influenced by C20 design, including Jane Foster, Lucie Summers and the work from St Judes. I also like paper cut artists Nikki Mcclure and Rob Ryan and have a weakness for etchings and other printmaking techniques. 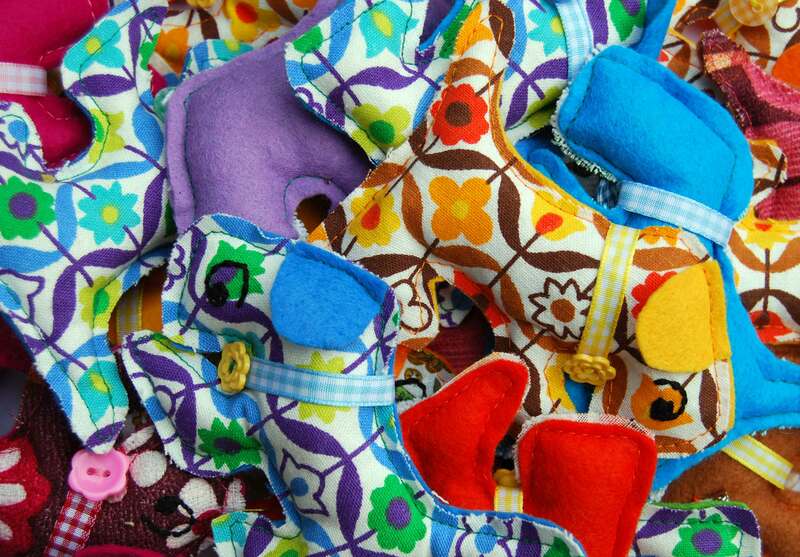 I am also lucky to be part of Folksy, a UK handmade online shopping site, full of lots of contemporary UK talented designers, makers and artists. Their work is a constant inspiration. What new projects do you have planned next? I am working on a fabric nation textile, creating a map of the UK using my vintage fabrics for each county. 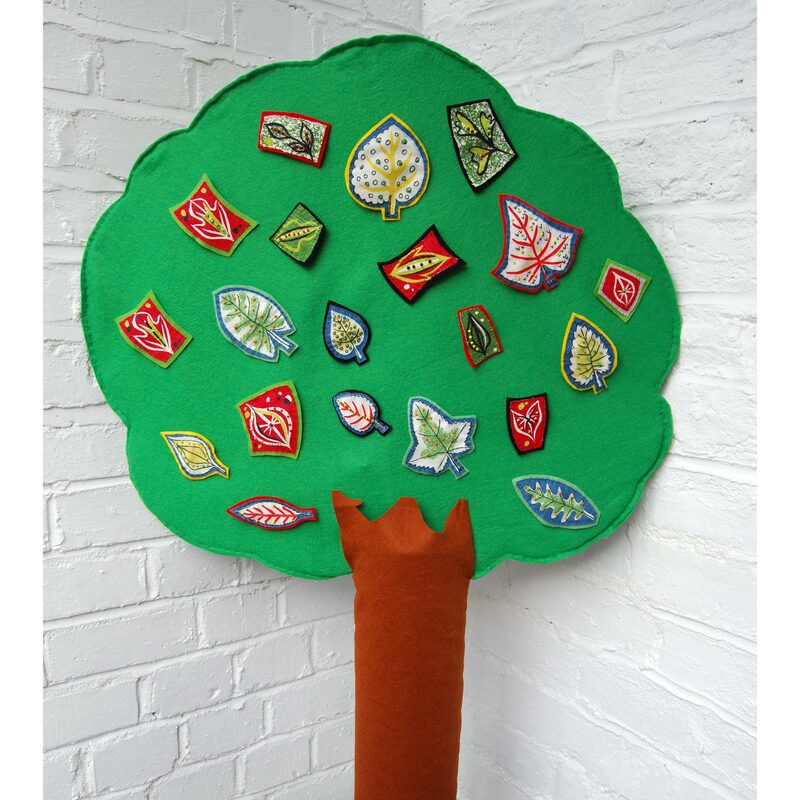 I am also looking forward to my fabric Christmas decorations, based on old fashioned baubles and trees. And finally, do you have any exhibitions planned? I have a folksy shop and a busy few months ahead and will be taking part in the Got Craft, Crafty Pint Christmas Workshops, Handmade in Tooting and a few more! Gina Glover was born in London, England. She trained in Fine Art at Chelsea School of Art, later obtaining a photography degree at the University of Westminster. She is a co-founder and Director of the Photofusion Photography Centre, London and a freelance photographic artist and lecturer. Gina makes site specific artwork for hospitals and lectures on themes such as ‘Creativity, Photography and the Mind’. In 2008 Gina received the Royal Photographic Society’s Hood Medal, and she has been twice winner of the Medical Research Council/Novartis/Daily Telegraph Visions of Science Award. Much of Gina’s work involves stories, symbols and time. She explores sensual and emotional responses to the world, much as one does as a child. She uses a simple pinhole camera which is little more than a box with a light-hole and through her long exposures constructs images through layering light on film, a process which seemingly slows down time and alters our perceptual balance. Gina Glover’s book, Object of Colour: Baltic Coast, recently published by Foxhall Publishing Ltd, is a collaboration with the novelist and poet Kay Syrad, featuring Kay’s poems made in response to Gina’s photographs of Latvia, Lithuania, Poland and Estonia. Gina is pleased to be taking part in the Wandsworth open house as she will be exhibiting with her daughter Jessica Rayner. She looks forward to meeting and exchanging ideas on her work with local people. 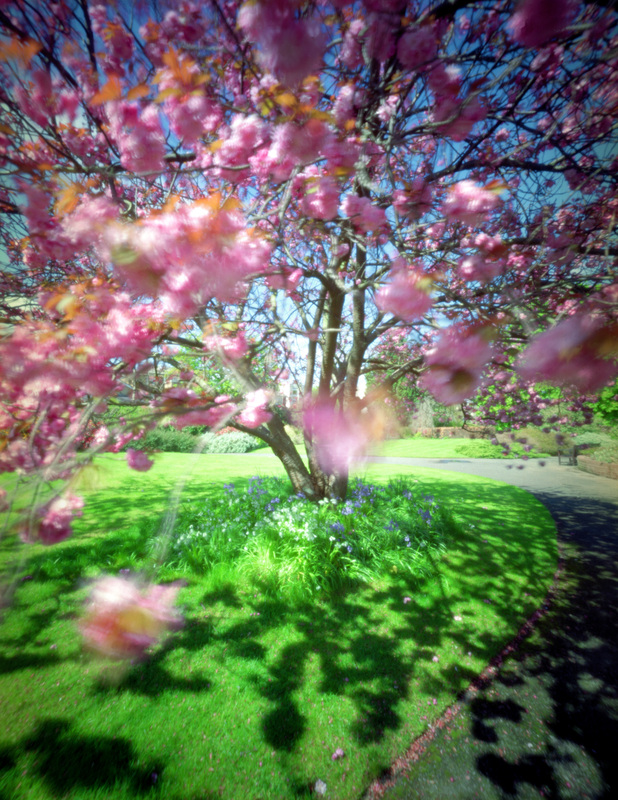 Visitors will be able to see a wide range of work both her personal pinhole photography and her artworks relating to science and art made during her art residences in hospitals. Photofusion picture library distributes her social documentary photography, and Millennium and Corbis distribute her art photography. Her fine art prints are distributed by Keith Cavanagh, London; De Santos Gallery, Houston, USA; Wanted Paris, Paris; and Le Bleu du Ciel, Lyon, France. Thank you. 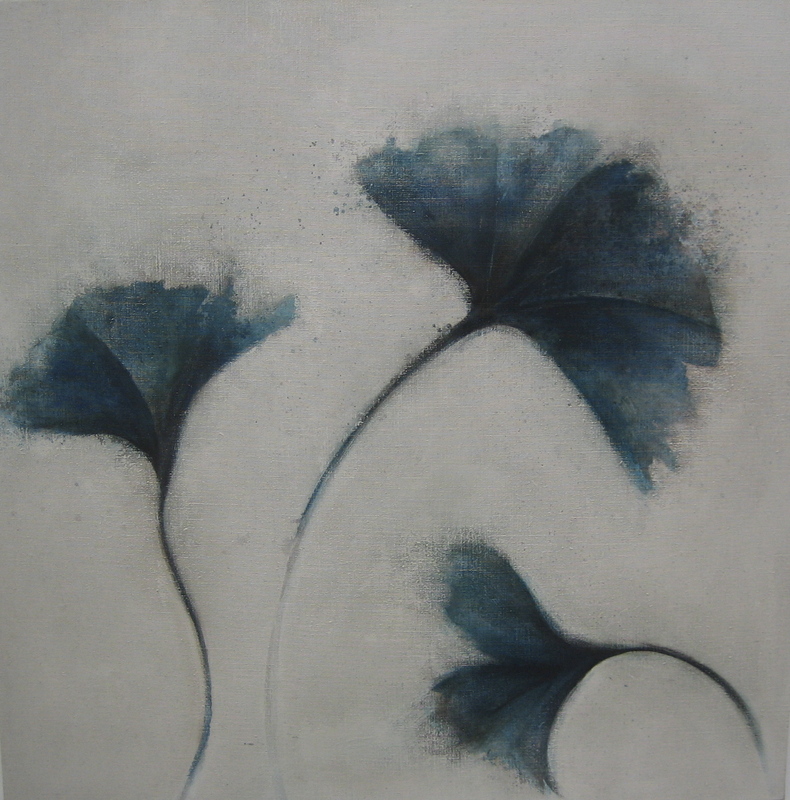 Gina’s work can be seen at venue 53 in the brochure. 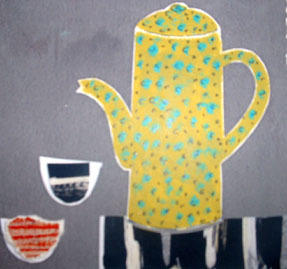 Visit the Wandsworth Arts website for a guide to all the Wandsworth Artists Open Houses.